Easy Pie Crust Recipe for French Apple Pie and More. This easy pie crust recipe is for a one crust pie or tart shell. It is so simple it absolutely amazes me. It is prepared like this in France at pâtisseries (bakeries) and by French people at home. No cutting the butter into the flour and rolling it out. You melt butter or margarine on the stove then add the flour. Sounds ridiculous doesn’t it? This technique produces a very delicious pie crust. You can use it very successfully for famous French desserts like French apple pie, for fruit tart recipes and one crust pies. 2. On the stovetop in a saucepan over medium heat add the butter, water, salt and sugar. 3. When butter is melted and starting to sizzle a bit, turn off the flame. 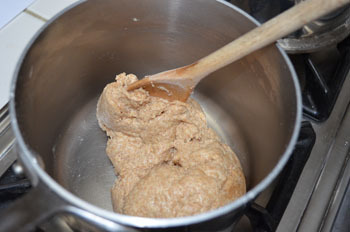 Add the flour all at once, and stir with a wooden spoon until you form a ball of dough. dough ready to spread in the pan. I used spelt flour which is why the brown color. White flour is the traditional french recipe and makes for a lighter result. Hmm... I wonder what they used way back in the middle ages? 4. Place the ball of dough in the center of your pie pan and spread with the palm of your hand. Unbaked crust for a tart. 5. There are now three options depending on what you will be putting in your pastry shell. A. Fill your uncooked pie crust with your pie filling and bake. 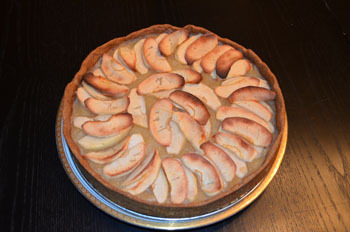 A partially baked shell is very good for any number of tart and pie recipes especially for this French apple pie recipe (tarte aux Pommes). The pre baked method helps the bottom stay flaky and not get soggy. 1. Place a sheet of aluminum foil on top of your dough in the pie or tart pan. Add dried beans or weights to the top. (This keeps the crust from pulling away from the pan). 2. Place in the middle rack of your 400F preheated oven and bake for 8-9 minutes. 3. Lift out the beans and foil. Prick the dough with a fork. 4. Bake 2 -3 minutes more. You know it’s ready when your shell is starting to color and just starting to shrink from the sides. 5. Let cool on a wire rack while you prepare the pie filling. 6. If you are making a tart you can take away the sides of the spring form pan and cool. 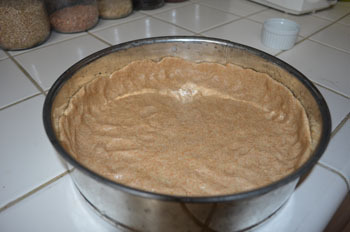 If you feel the crust will fall then keep the pan sides in place until after you cook it with the filling. A fully baked shell is very good for cold fruit tart recipes or pies and tarts where the filling only needs to bake for a short time. 1. In 410F oven bake on middle rack for 15 minutes. 2. Let cool on a wire rack before filling. If making a tart see step 6 above for options.